Dear friends I am on a "Challenge entering" spree ...I am surprised that I have managed to post 16 times this month. Last month I was debating stopping blogging altogether [ you can read about that rant here : simple handmade flowers] and this month here I am blogging as if I have nothing else to do!! I do feel a bit crazy!! Has that ever happened to you too? 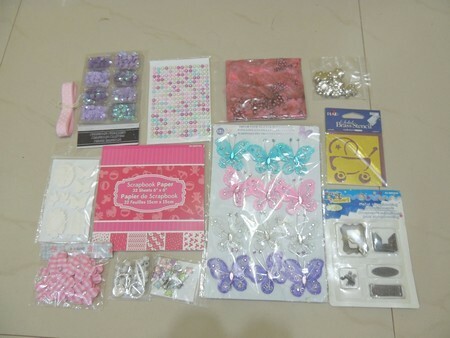 I have a bad habit of hoarding crafty goodies for months and sometimes years especially if I have won them or been gifted them! Now I have resolved to use at least part of my winnings/ gifts as soon as possible ! 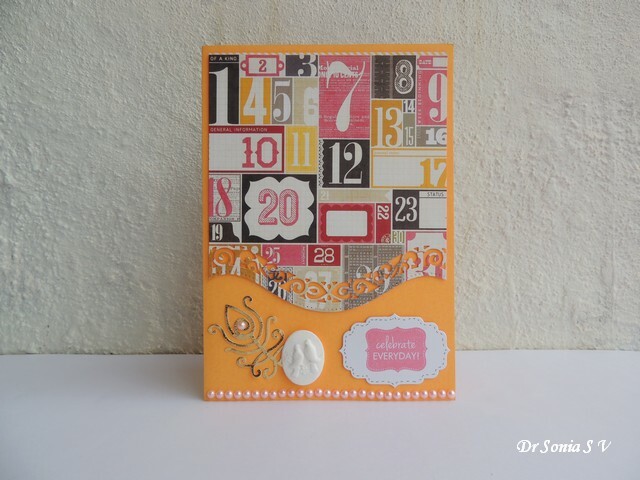 The gorgeous paper used in this simple card was part of my winnings from the Craft Shop Lulupu [ owned by the talented Karuna]for this project : Spinning Pop Up Ball Card . It was just the perfect paper for me to make a card to enter the All sorts Challenge themed " Numbers"
I wanted the numbers to signify dates and the sentiment echoes "celebrate everyday"
I wanted to add something in the empty space and my handmade bird clay embellishment just seemed to scream " add me, add me"!!! Sorry I do sound like a loony lady dont I! 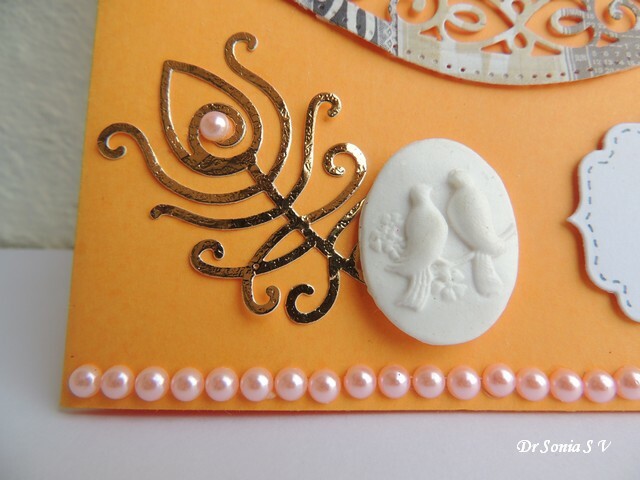 Well I was thinking of my hubby when I made this sort of masculine plain card and he loves birds and enthuses so much when he sees any feathered being! 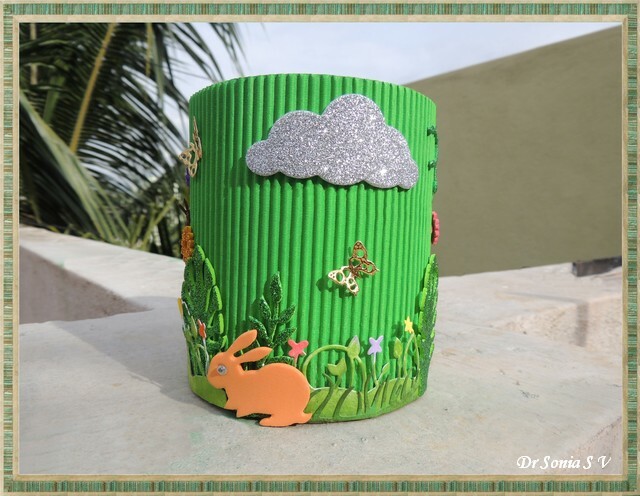 Hi friends one of the best things about having a paper-crafting hobby blog are the numerous fun challenges you can participate in. One gets to see so many inspiring creations, stretch one's one creative potential and if lucky ,win a prize too !! 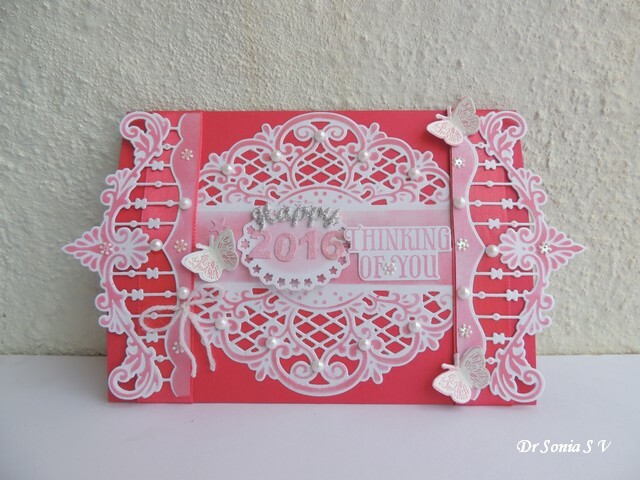 This New Year Greeting Gate fold card is held closed at both ends by a band of ribbon on which I added a Marianne Border die cut, a little yarn bow, a few pearls and floral sequins . 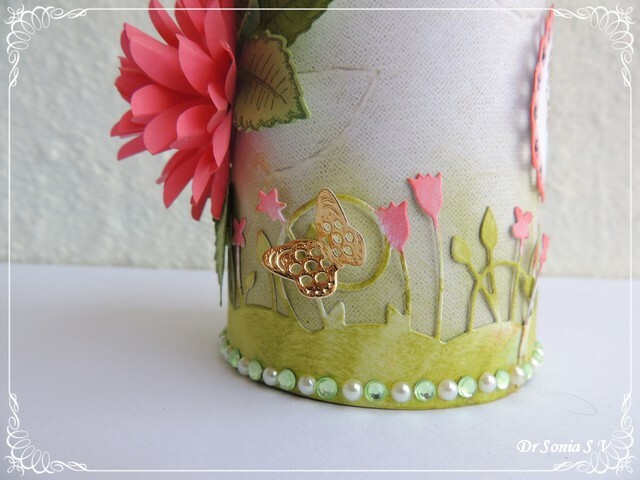 The Butterflies on the ribbon band and the flap of the card were stamped with a Hero Arts stamp, heat embossed with white embossing powder and colored with distress inks. They shimmer so beautifully in real...not able to quite capture it in the photographs! 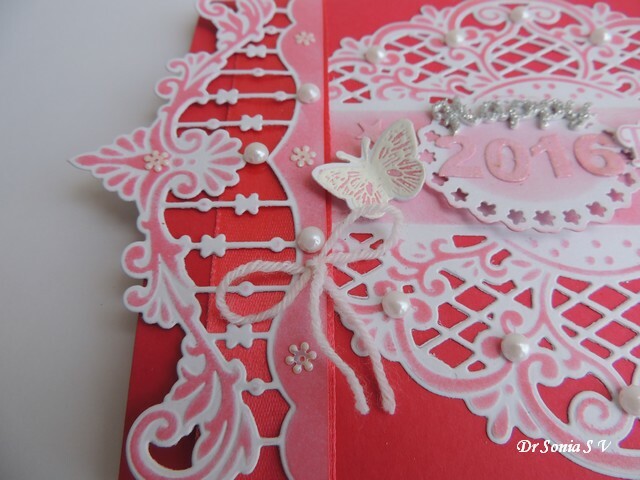 On sliding away the ribbon bands the interlocking flaps of the card can be opened. 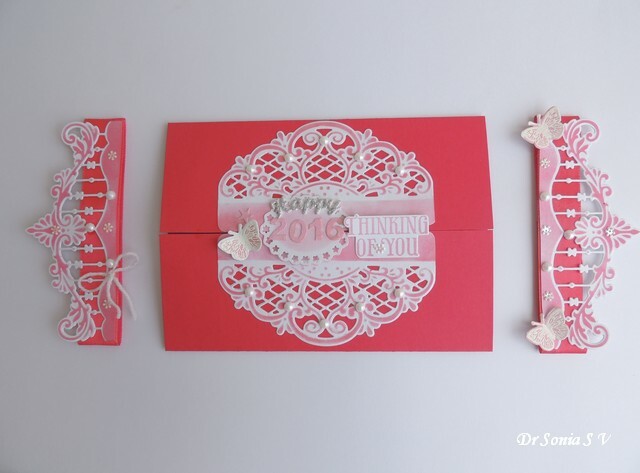 I placed the stamped "Thinking Of You" [ another Hero Arts stamp- Sizzix die set] on one flap and the "Happy 2016" on the other flap and overlapped them slightly to form a sort of lock! 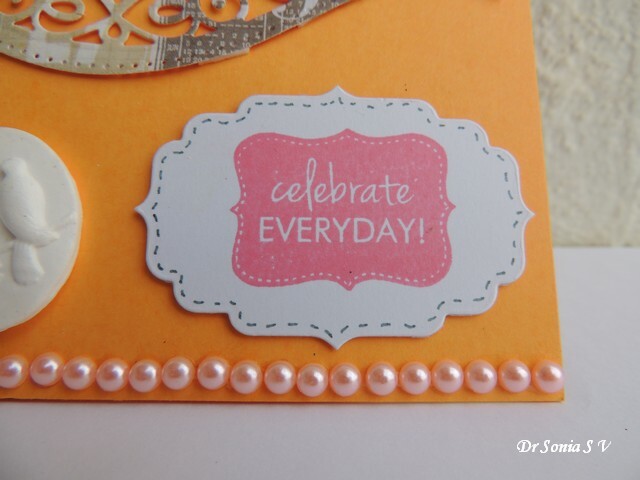 On the inside of the card I added a Hero Arts - Sizzix stamp -die flower , a heat embossed butterfly and a sentiment sticker on layered Spellbinders Labels 8 die cuts. 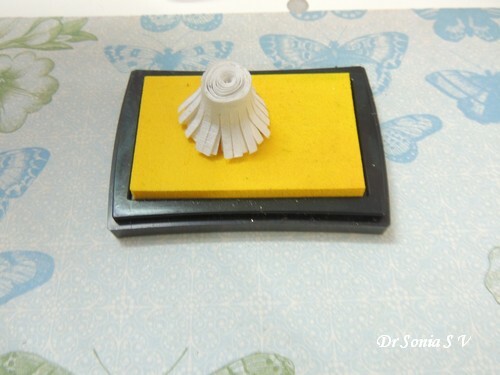 Hi friends sharing the last in the series of 10 DIY pen stands we made for Teachers Day. 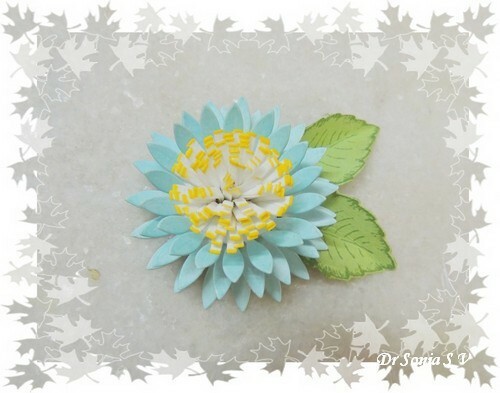 This one has a huge 3 dimensional flower which is quite easy to make as you can see in the photo tutorial collage below. Those white spirals were a find from my local market and though delicate I love how they look! Since this Pen Stand was a gift for my daughter's teacher...we added a heat embossed " Thank you " sentiment. 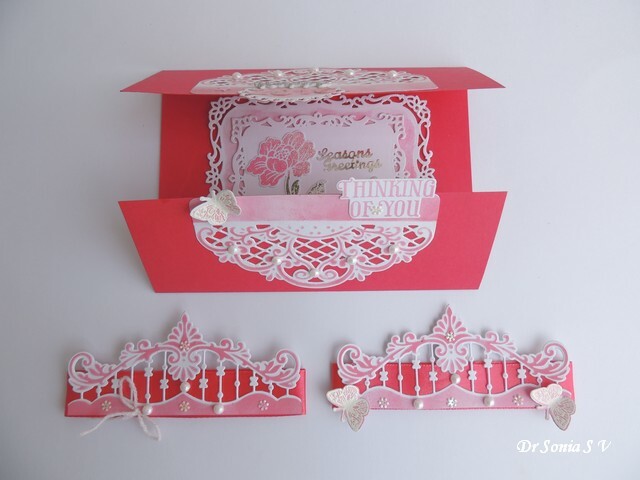 I loved using the Memory Box Spring Border in my series of pen stands...it gave a subtle uniformity to the series! 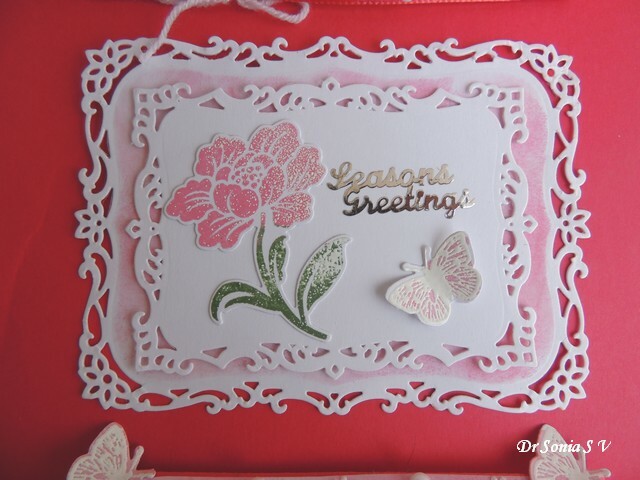 The leaves were made with the Heartfelt creations Botanical Wings stamp- die cut set. And of course I couldn't resist adding a tiny golden butterfly. 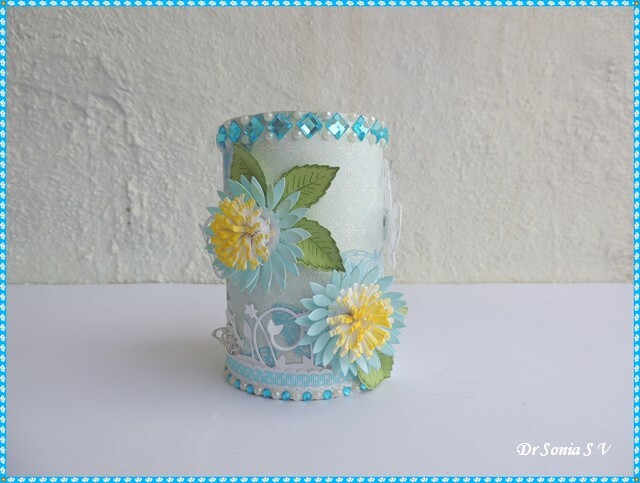 Hi friends....surprised to see a Christmas Project so early on my blog..? 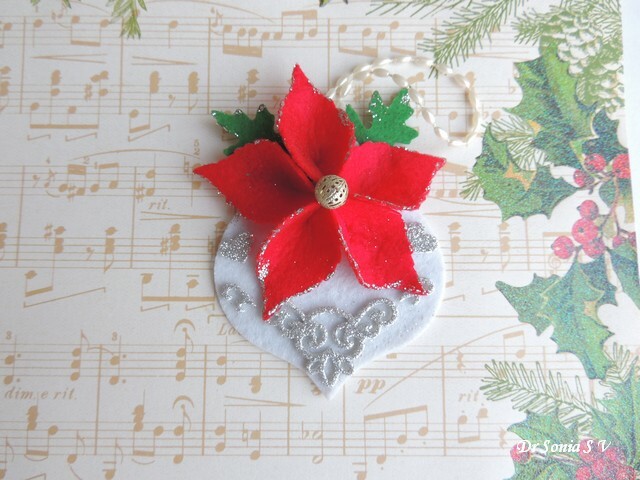 Well I chanced upon a gorgeous blog Scraps of Life by ScrappyMo with a Challenge to post a Christmas project and what I especially liked about the challenge was she encouraged bloggers to comment on other blogs. Some time back there was a Challenge blog called MIM which encouraged blog comments and I loved it very much since I had made so many new blogger friends through that blog. 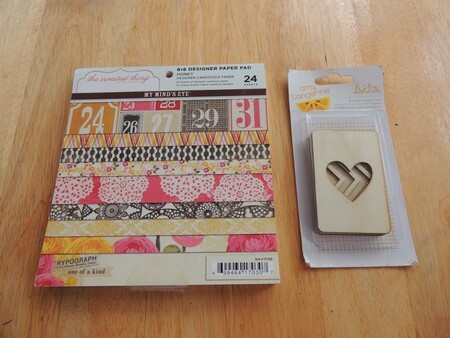 So I was super thrilled to find a Challenge encouraging us to make blogger friends! 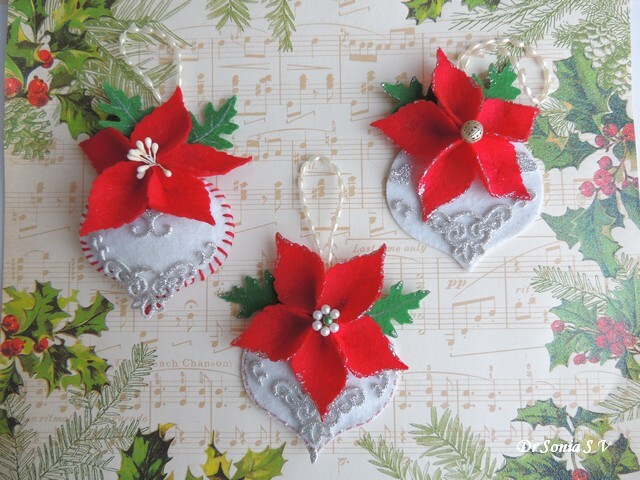 I made these simple felt Christmas tree ornaments by cutting a Sizzix Ornament die in cardstock, layering the same die cut in felt on top and embellishing with foam die cuts. 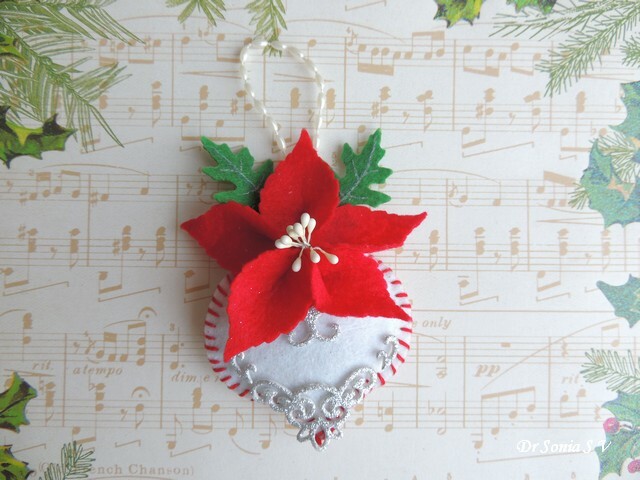 I made the felt poinsettias by hot gluing "leaf " die cuts! Yes I dont have a poinsettia die and had to improvise! 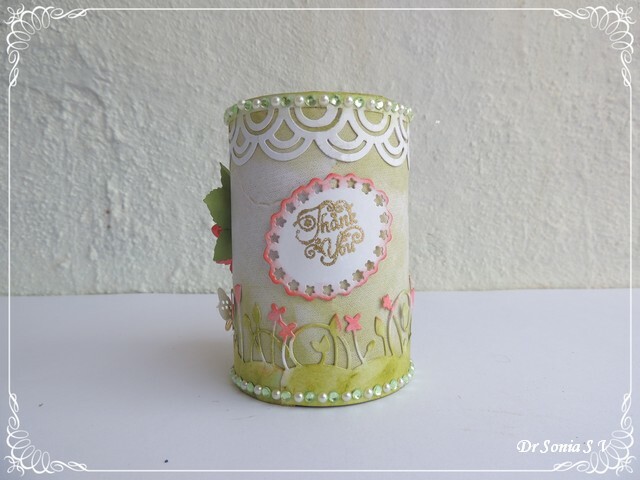 Hi friends, sharing another Teachers Day Pen Stand and this one was made by my daughter! 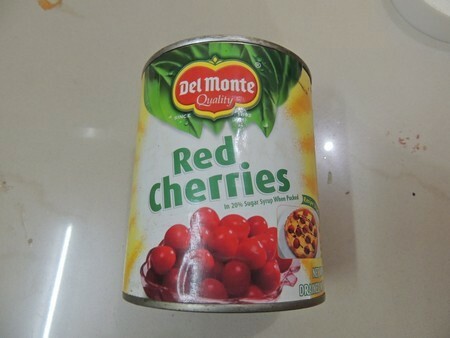 We removed the paper cover of the tin can shown below and lined it with corrugated paper. Most of the die cuts using in this project were cut from foam and my kiddo painstakingly glued on every piece! 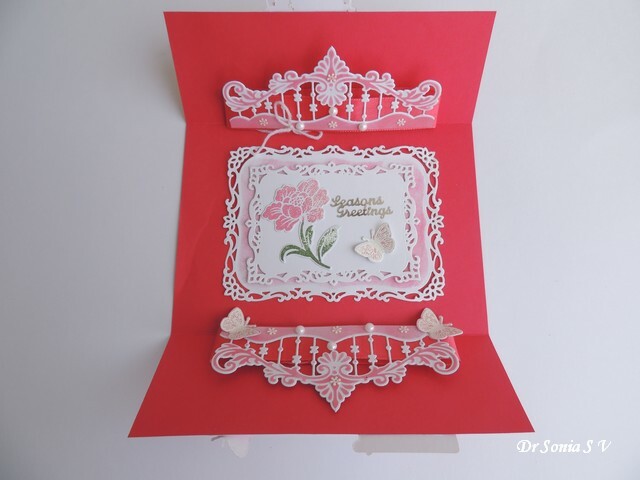 The Memory Box Spring Border was colored by her and it does look cute with the little bunnies doesnt it! Lots of glittery flowers and leaves on this one and of course a sliver cloud too! I hope you liked my daughters gift for her Teacher! Hi friends a special Thank you to all my friends who have been dropping in and writing such sweet comments on the Pen Stand posts...I know it might be getting monotonous but still you are so kind to leave lovely comments! 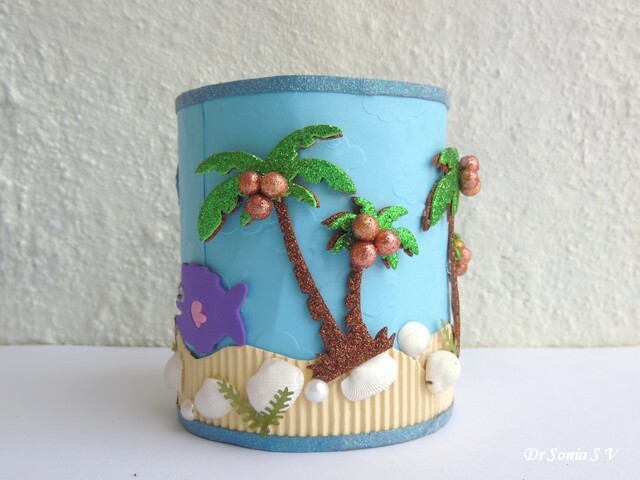 This recycled tin can pen stand has a blue color scheme . I used a DCWV paper as the background and added rhinestone borders , a lacy blue ribbon and my favorite Memory Box Spring Border die cut. 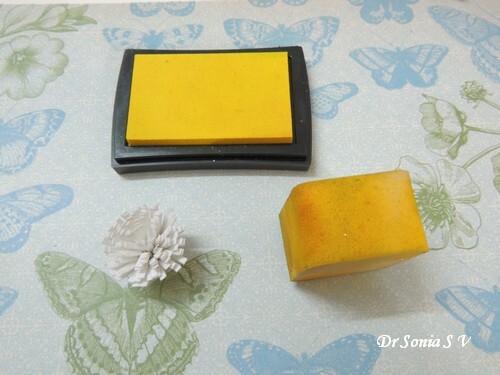 The blue butterfly was cut from glitter foam and the gorgeous white butterfly in the photo below is very special to me as it was part of my giveaway win from the supremely talented Pamelia! 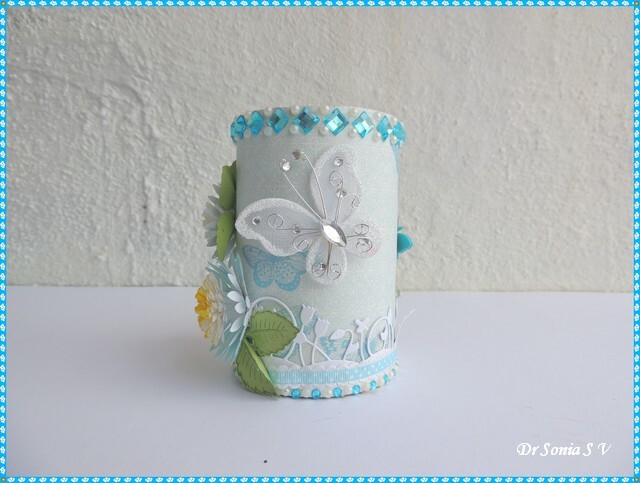 Pamelia, your butterfly has found a good home as this Pen Stand was gifted to my daughter's teacher as a Teachers Day Gift! These are all the yummy goodies Pamelia sent me all the way from Canada. Thank you so much Pamelia! !I feel like hoarding everything! If you have been following my blog you will know I love making flowers! Making handmade flowers usually takes time but knowing a few tricks can help speed up the process when you are in a hurry as I was here! 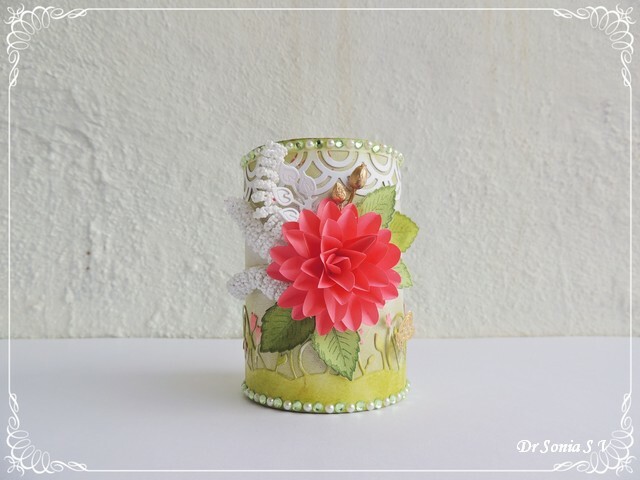 Paper : I have often seen new crafters ask "what type of paper should be used to make flowers" ---the simplest answer to this is any type! 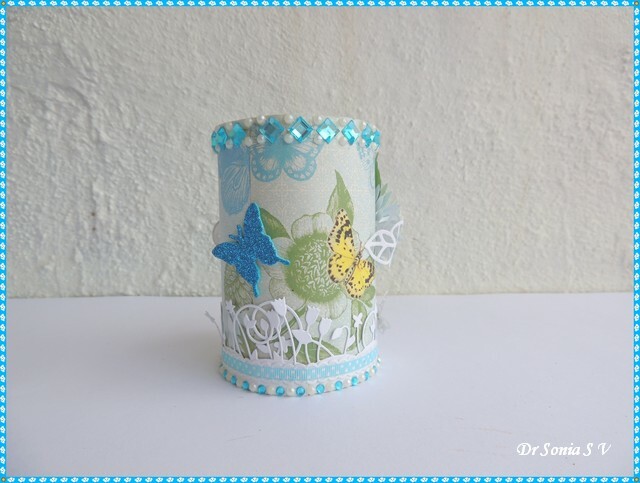 Using different types of paper will give you different looks and for some flowers some papers look better! The key is EXPERIMENT ! 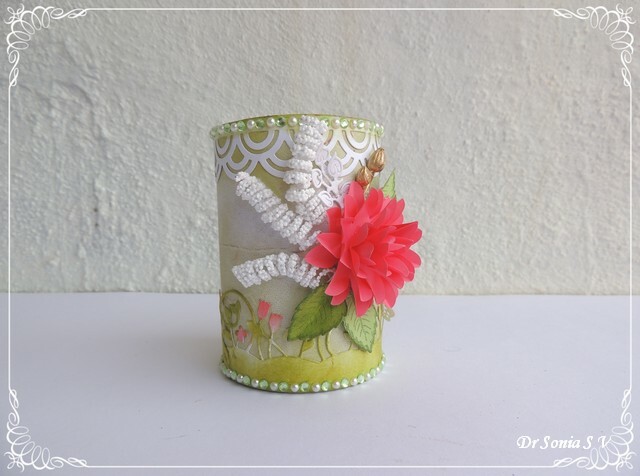 For this easy fluffy flower I was looking at the easiest and quickest technique and hence considered the pliability and flexibility factor while choosing the papers. 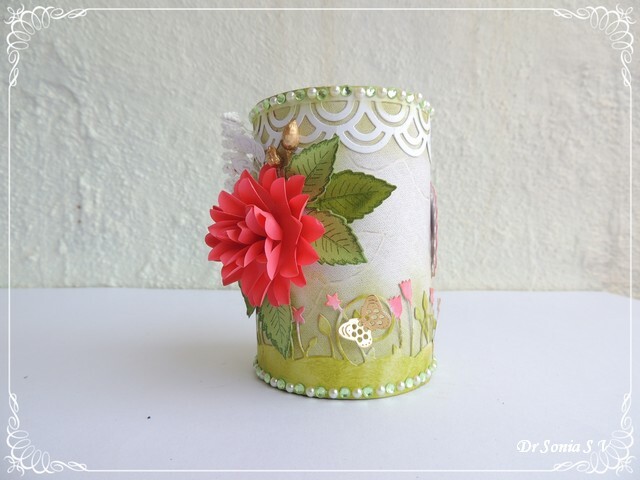 For the Outer petals : I used thick Ivory Card [ available at local stationary stores as huge sheets] to die cut the outer layer of flowers since I wanted the outer layers to hold the shape and remain stiff with just a little embossing [ time saver!] . For the Center : Since I was making my center a fringed flower [ I used the memory box fringe border die] I needed a paper which was pliable and easy to bend so I choose thin handmade paper. 1. 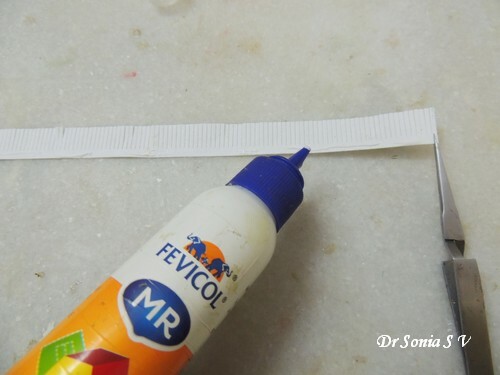 Hot gluing can leave unsightly glue strings which are a pain to pick out especially when you are in a hurry! 2. Hot gluing thin paper especially on steps requiring you to shape the petal as you glue can leave your fingers sore from the burns! And though I did purchase the protective Mod Podge finger caps to save my fingers from hot glue...I hardly ever use it while flower making as I find it very bulky and it slows me down! 2. 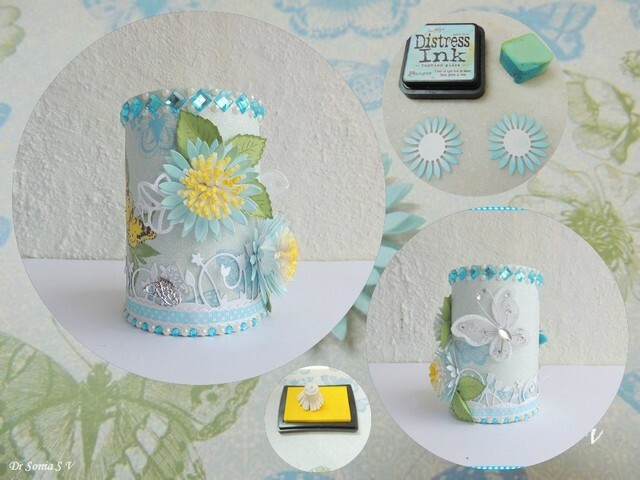 Ink Pads - believe me they are the easiest way to add a dash of color! 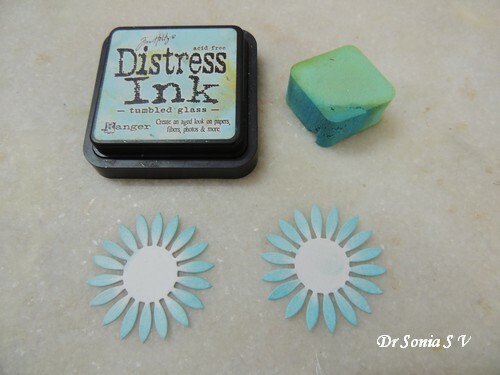 And for this I prefer some types such distress ink pads rather than memento or archival ink ! 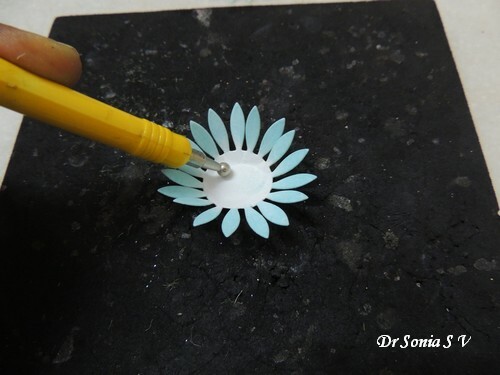 You can ink just the petal tips and not waste time inking the center as the center is going to be hidden by the fringed flower. 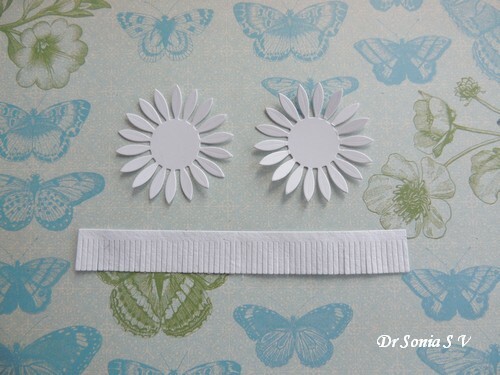 Make a long fringed paper strip by die cutting , hand cutting etc [ I have written a detailed post on fringing here : Simple Flower tutorial ], grab one end with a forceps , apply adhesive and roll! 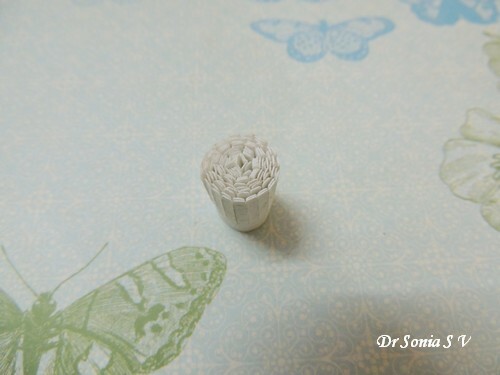 For this flower I joined 2 fringed strips before rolling as I wanted a full and fluffy center. 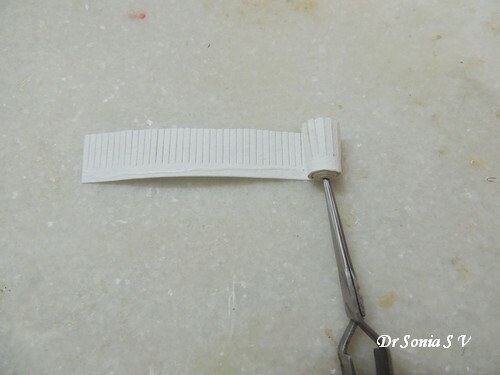 Dont roll your paper strip too tightly or too loosely ! It looks cool "un fluffed" but since we are talking about quick tips...the quick way to get a full looking center is to fluff out your rolled fringed strip! 2. An even quicker option --- grab the fringed flower and directly twirl it on your ink pad...it takes just seconds to ink your flower!! In this flower I only embossed the center part of the flower and didnt bother about the petals. Since I was using really thick paper as explained it held its shape well. 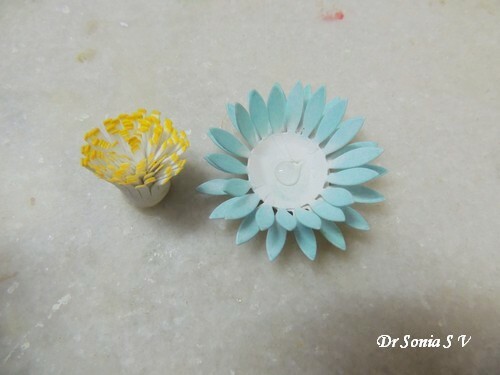 Stagger and glue 2 flowers and hot glue the fringed flower to the center! And you are done! 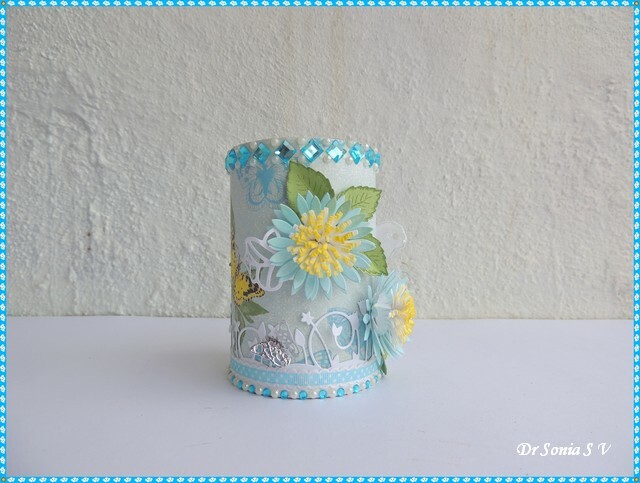 Add one more un embossed flower base if you want a fuller flower!Its not the most sophisticated looking flower but its a super easy and fun one to make! Hi friends I hope you are not bored of seeing all the Pen Stands we made for Teachers Day! 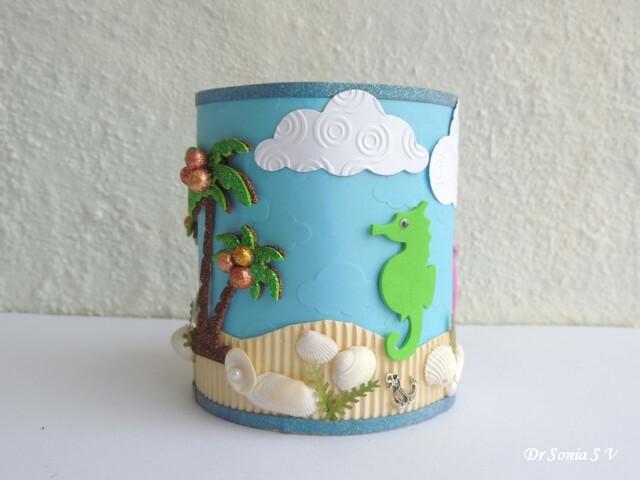 This Beach themed Pen Stand was designed and created by my daughter ;I only had to help in the hot gluing part to speed things up! 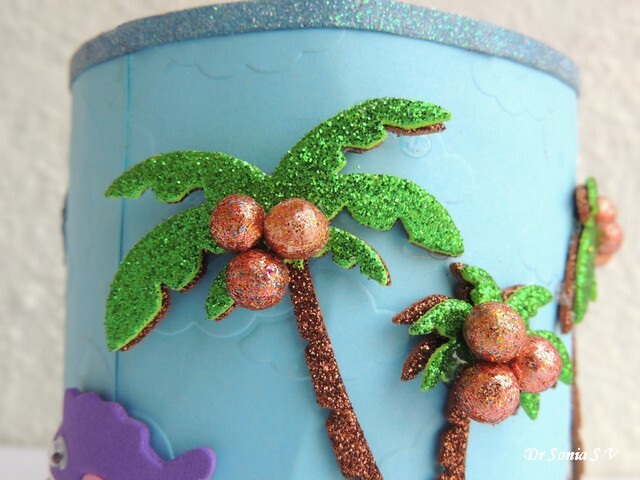 We needed a big tin for a beach scene so we chose to recycle this Cherry Tin! 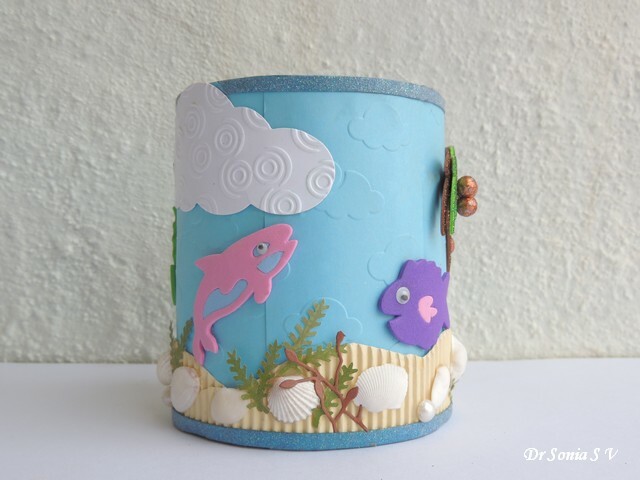 When I first bought the Big Shot in 2012 ,my daughter and I made a similar Ocean themed project and this one took us down memory lane! Owning a die cutting machine sure has been fun! 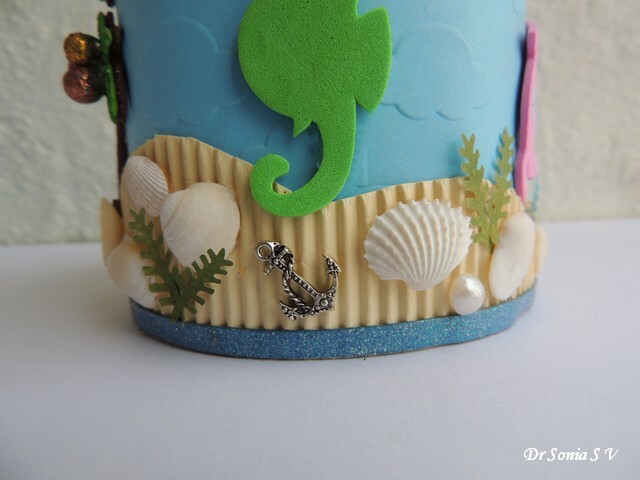 The sandy beach was hand cut by my daughter and the blue sky was embossed with a Darice cloud embossing folder.I had been hoarding the anchor charm for so long and this was the perfect project for it! 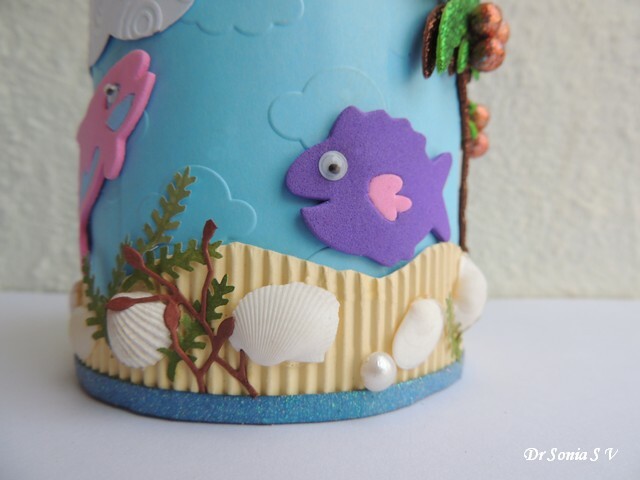 The sea horse and fish are foam die cuts we had picked up long ago. 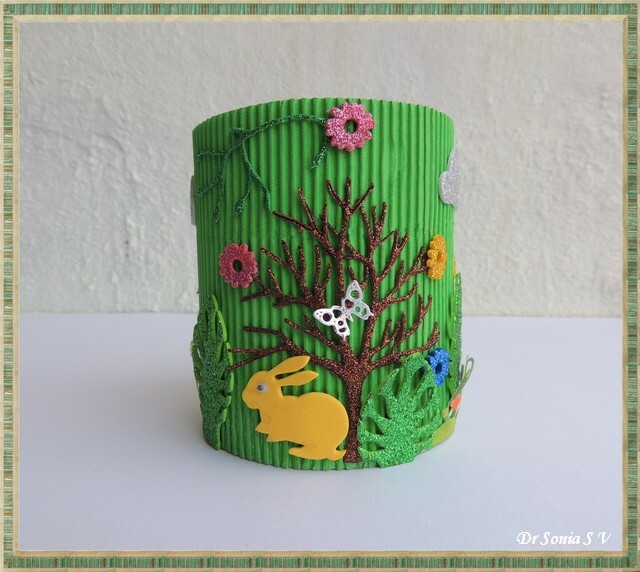 The brown sea weed is a Memory box die cut and the little green plants were punched using a Jef punch. I hope you like this simple project! 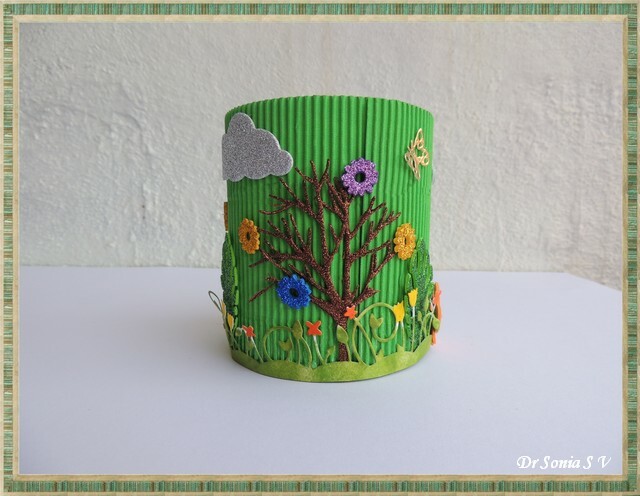 Garden themed Pen Stand !